As the sun begins to stay in the sky for just a little longer each day, the winter weather slowly starts to fade away in the Chicagoland area. As the snow melts, your garage may become damaged due to the excess water. However, there are a number of tactics you can tackle in order to clean up any messes made in your garage and prevent any damages from happening in the future. Snow can be brought into your garage by a number of ways. One major one is by you pulling your car in and out of your garage every day in the winter. Snow can get stuck under your car or on your tires and melt overnight, causing water to seep through the surface and cause long term damage to your garage floor or walls. 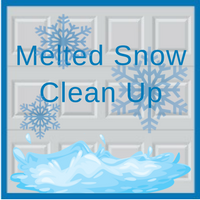 You may discover that melting snow is coming in through openings around your garage door too. Knowing the root of the problem will make it easier to keep it from happening again. Now that you know how water entered your garage, it is now time for the most important step: cleaning up the mess. In order to soak up any water, squeegee the garage floor. This will also help to remove any ice that could have of fallen off of your car. Another quick fix is to install a heater or blower fan to dry the inside of your garage. Garage floor mats – Putting down mats in your garage is a quick and easy way to protect your garage floor. They are able to collect any snow or ice that lands on the floor so that the water does not cause damage or danger hazards. As a temporary alternative, you can even lay down cardboard boxes to absorb the wetness. They are an inexpensive solution for any water damage occurring in your garage. Stay on top of garage clean up – One simple way to make sure your garage does not have to undergo any damage is to keep up with the cleanup process. If you are aware of the condition of your garage, you should have limited issues when it comes to water damage. Seal open areas around your garage door – Another way to prevent garage damage is to use a sealing solution on the door. Made out of silicone, garage sealers can be applied by any homeowner. They will help prevent any water from getting into your garage and causing issues. It is important to keep up with garage maintenance during the transition from winter to springtime in Illinois. Blue Sky Builders is dedicated to serving our clients with their garage maintenance needs. If you are interested in more information regarding garage spring time clean up, please contact one of our Chicago area garage experts. Call us at 630-852-8485 or visit us online.